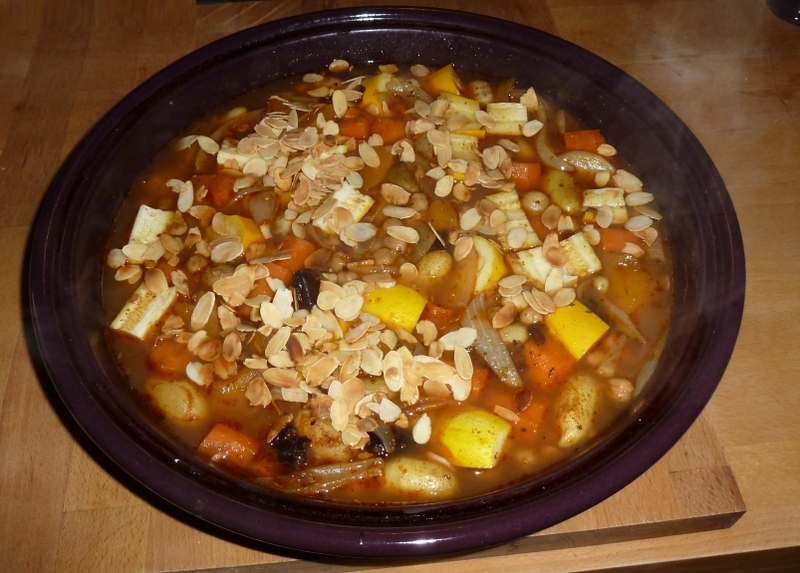 This is a lovely tagine made with lovely autumn ingredients – enjoy! This is our second tagine recipe – you can find the first Moroccan Tagine recipe here. 50g flaked almonds dry fried. Be careful not to burn them, turn off the heat when you see the first flake of almond looking close to burning. This takes only about 5 minutes. You need to keep them moving in the pan, even when the heat is turned off. In a medium saucepan, heat the oil and the butter. Cook the onions on a medium heat until they start to soften, add the garlic and cook gently until they start to brown. Turn off the heat. Put the veg stock, herbs and all veg into a tagine or large casserole dish and add all the veg except the courgette, spices and herbs. Leave the tagine to stand all day if possible, stirring once or twice. Put the tagine in the oven and then put it on to 180`C. Wait for an hour. Take out the tagine and check the potatoes and carrots are soft. Taste the sauce and adjust seasoning if necessary. If the veg are not soft, return to the oven for 15 more minutes. If all veg are cooked, turn off the oven add the courgette and return to the oven while you prepare the couscous. In the same saucepan that you prepared the onions and garlic, put the couscous, spices and water. Leave for 10 minutes. Then add a splash of olive oil and fluff with a fork. If it’s a bit stuck together, add a knob of butter and fluff again. Scatter the almonds on the tagine, serve the couscous onto warmed plates and put the tagine in the middle of your table so people can help themselves to the delicious juice when they need more…. What a lovely dish! I look forward to trying this tagine recipe. 🙂 Thanks for sharing.